There’s a new option available for hair, skin and nail care in downtown Santa Barbara, and it comes with the advantage of helping train the next batch of estheticians and cosmetologists. Santa Barbara City College’s cosmetology academy and esthetics program is open for business, offering full-service beauty care to clients in the region. The salon at 525 Anacapa St. is open from 10 a.m. to 2:30 p.m. Monday to Thursday, and 9 a.m. to 2:30 p.m. on Friday. For more than 10 years, the program was previously located at a smaller site in the Magnolia Shopping Center near the city of Goleta. Last year, the SBCC Foundation purchased the $5.3 million, 10,000-square-foot building, which previously housed the Paul Mitchell beauty school that closed in 2016. “It was an opportunity that we couldn’t pass up,” said Geoff Green, CEO of the Foundation for SBCC. He added that the property purchase is a first for the nonprofit organization. Men and women are welcome to take advantage of $7.50 haircuts, $15 pedicures and $30 facials, among other services — all while students are honing their skills. On the first floor, students blowdry clients' hair, paint customers' fingernails and utilize the new hair-washing sink bowls. A handful of students are practicing perms and using spiral curlers with a mannequin head in another cosmetology space on the first floor. The first floor also features a client waiting space and retail beauty products for purchase. “The environment is more reflective of the real salon environment in our community,” said Melissa Moreno, vice president at SBCC's School of Extended Learning. “We welcome the public to visit because our students learn to practice on clients. We want to community to be part of training our students." The top floor is classrooms and includes a balcony overlooking the French Press. All services are supervised by full-time faculty, Moreno said. 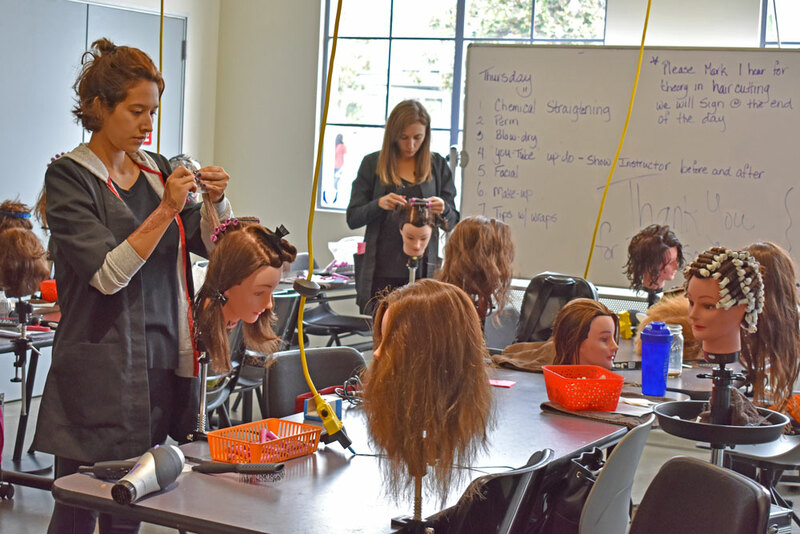 Following the SBCC training program, students are prepared to take a licensing examination under the California Board of Barbering and Cosmetology before going into the field. Anyone interested in scheduling an appointment can call the salon at 805.683.4191. — Noozhawk staff writer Brooke Holland can be reached at bholland@noozhawk.com . Follow Noozhawk on Twitter: @noozhawk, @NoozhawkNews and @NoozhawkBiz. Connect with Noozhawk on Facebook.